May is a month for merriment! 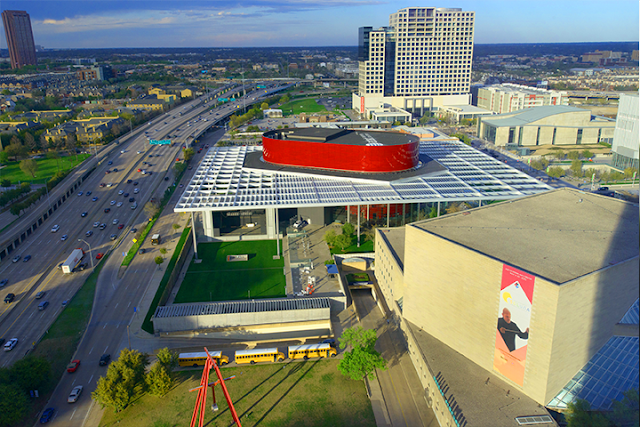 From visiting art exhibits, relaxing at outdoor concerts or enjoying any of the daily interactive activities at Klyde Warren Park, the best experiences are always happening just steps away from Museum Tower Dallas. Music arrives to the Dallas Arts District like never before this month. From the inaugural SOLUNA International Music and Arts Festival to Homegrown Music and Arts Festival to the return of live outdoor concerts, take the time to listen to the beauty that surrounds us. Living at Museum Tower, you reside in the heart of it all. Sit back, relax and soak in the sounds of a life well-lived at Museum Tower. To help simplify the life of its homeowners, Museum Tower shares timely information and reminders about these events on social media. Like Museum Tower Dallas on Facebook and follow @MuseumTwrDallas on Twitter and Instagram. Use #MuseumTower for the opportunity to be featured on Museum Tower’s social media. Winner of the Kennedy Center’s Jean Kennedy Smith Playwriting Award, Colossal is an epic theatrical event. With the flexible Wyly Theatre transformed into a football field, director Kevin Moriarty will create an intensely physical production of this spectacular and deeply moving new play. Featuring full contact choreography and a drumline, the play centers on a University of Texas football player, struggling to move forward in the wake of a catastrophic spinal injury. A play about love, ability, and extraordinary feats of strength, Colossal is both a celebration and critical examination of our nation’s most popular form of theater. They delivered the papers, until they made the headlines. Direct from Broadway comes NEWSIES, the smash-hit, crowd-pleasing new musical from Disney. Winner of the 2012 Tony Awards for Best Score and Best Choreography, NEWSIES has audiences and critics alike calling it “A musical worth singing about!” Filled with one heart-pounding number after another, it’s a high-energy explosion of song and dance you just don’t want to miss. 2015 marks the inaugural year of SOLUNA International Music and Arts Festival in Dallas. This year’s theme is Destination (America) in honor of the artists who came to create in freedom and to those inspired by a uniquely optimistic view that is central to the American experience. Anchored by DSO performances led by Music Director Jaap van Zweden, the three-week festival will showcase internationally-acclaimed guest soloists, artists and ensembles in visual and performing arts along with the leading companies and ensembles in the Dallas Arts District and beyond. SOLUNA will be all about the magic that can happen when music meets film, movement, or visual art, in settings previously unexplored. For a complete schedule of the incredible events during SOLUNA, visit www.mydso.com/solunafestival. Dallas’ first all local music and arts outdoor festival continues to provide itself an annual celebration of Homegrown music, arts and fun. This year, the event will feature 12 acts with ties to the state of Texas performed across a variety of genres and styles of music. Dallas Black Dance Theatre completes their 38th season with classic and contemporary works that push boundaries. Premiering in this series will be a new commissioned world premiere work and one company premiere by master choreographers, Daniel Catanach and Jamal Story, and the return of Bridgette Moore’s classic work Southern Recollections. And you don’t want to miss DBDT’s special guest artists; two principal dancers from the Alvin Ailey American Dance Theater will take the stage on Friday, May 15 to perform Pas de Duke, a virtuoso duet to the music of Duke Ellington. Remarkable and breath-taking, Command Performance is the definitive Dance Event of the Year. From classic pas de deux to amazing contemporary works, TITAS Presents’ annual gala is simply not to be missed. Dancers include Yuan Yuan Tan (San Francisco Ballet), Clifford Williams, MOMIX, and special guest Lil Buck, remaining cast yet to be announced. Command Performance has also become a platform for newly commissioned works by some of the dance world’s brightest stars such as Dwight Rhoden, Mia Michaels, Jessica Lang and Twyla Tharp. Year after year, Command Performance brings thrilled audiences to their feet with one of the most dynamic and unforgettable evenings of truly “world-class” dance. Since 1995, Rude Mechs has created a mercurial slate of 24 theatrical productions that represent a genre-defying cocktail of big ideas, cheap laughs, and dizzying spectacle. With Stop Hitting Yourself, Rude Mechs is embracing the fundamental beliefs underlying late-stage capitalism and indulging in our version of 1930’s Hollywood glamour. Part Pygmalion, part Busby Berkley, part self-help lexicon — all while dancing around a queso fountain. Rude Mechs borrows from the plots of 1930’s musicals to dig into the contemporary conservative dilemma: how to honor steely individualism without disavowing the virtue of charity. Alastair Macaulay, of The New York Times stated that Ballet West, First Soloist, Rex Tilton “may well be one of the most versatile young male dancers in America.” From Balanchine to Bournonville and Petipa to Tharp, Ballet West boasts a rich and varied repertoire, elegant and versatile artists and an American style and legacy that is as dynamic, expansive and unexpected as the Rocky Mountain region it represents. Ballet West has toured the world several times over presenting the very best in American classical ballet. A company of gifted dancers, the company gained instant fame as the focus of the reality TV series Breaking Pointe. Ballet West’s dancers have become household names across the country. Famed visual artist Pipilotti Rist's original video projections accompany Rozsa's electrifying Andante for String Orchestra. DSO Artist-in-Residence Conrad Tao performs the Spellbound Concerto. Plus, the early 20th Century's most famous composers who improbably found a home in Hollywood - Korngold, Schoenberg, Steiner, and Stravinsky. The American master gives voice to the eternal struggle of Creator and creation, father and son. The DSO with the Dallas Symphony Chorus and the Children's Chorus of Greater Dallas perform the impassioned Kaddish plus Bernstein's Serenade with violinist Liza Ferschtman. Writing about his third symphony to a colleague, Mahler said, "You can't imagine how it will sound!” With over 100 musicians on stage and two choruses, Mahler 3 is colossal in its scope and sweeping in emotion as it envisions the magnificence of Nature. Two-time Grammy-Award® winner Sylvia McNair's magnificent soprano brings out the best of Broadway as she performs selections from My Fair Lady, The Music Man, Camelot, Porgy and Bess, The King and I and A Chorus Line. Jeff Tyzik leads this electrifying conclusion to the 2014/15 Dallas Symphony Pops Series. Project Trio joins the Dallas Symphony in reinventing Prokofiev's Peter and the Wolf. This contemporary version will inspire imaginations young and old. May is dedicated to the celebration of National Asian-Pacific American Heritage Month. In honor of this celebration of heritage, the Crow Collection of Asian Art is highlighting events as well as Asian-focused experiences in and around Dallas all month long. Each day at the museum, enjoy new events, activities and more celebrating the rich culture of Asia. From India to China to Tibet and more, join the Crow Collection and take a trip around the world and back in just 31 days! Pack a picnic and make the simple stroll to Klyde Warren Park in your dancing shoes for a brand new live jazz concert series taking place every Saturday now through May 16. Local and national jazz musicians are planned to perform at the Muse Family Performance Pavilion including Spyro Gyra, an American Jazz fusion band that is currently touring all over the USA. This exciting new genre of concerts is sponsored by Chase and produced by Uptown Jazz Dallas. Be sure to keep up with Museum Tower Dallas on Facebook, Twitter and Instagram for timely reminders of all the incredible daily programming offered at Klyde Warren Park. No wristbands. No cover charge. Just good music. At 6:30 p.m. every Thursday in May, this green and serene spot #NearbyMuseumTower is where you can hear hometown music favorites and the best new artists flying under the radar. Sammons Park will have food trucks and cold drinks, with live music at its very best. Thanks to AT&T Performing Arts Center, the Dallas Observer and a grant from TACA, there is no entrance fee – so bring your friends and the whole family. Don’t miss this exciting new 2015 lineup for Cool Thursdays at the Dallas Arboretum! This year’s roster of performing musicians includes eight new bands featuring tributes to musical greats such as Elton John, Billy Joel and Buddy Holly. Of course, you’ll still enjoy the crowd-pleasing favorites including Emerald City, Bruce in the USA and Le Freak. Start planning your gourmet picnic or get your dinner from some of the best food trucks in Dallas. Either way, the food will taste great with the beautiful backdrop of White Rock Lake and great tunes! Tickets are on sale now and available for purchase online. Summer at the Arboretum kicks off with the return of the Dallas Arboretum Flower Houses on Saturday, May 16. Pecan Grove will once again be filled with the whimsy and magic of four giant houses draped in red, white and blue for a continued celebration of Texas. Featuring “Fairy Tales with a Texas Twist,” each house will appeal to the young and young at heart with storybook tie-ins and unmatched floral displays. Bobby Patterson’s life in music has had many facets. Whether as a DJ in Texas, a producer for artists like Fontella Bass and Little Johnny Taylor, a writer whose work has been covered by everyone from Albert King to The Fabulous Thunderbirds to Golden Smog, or as a recording artist—Bobby always brings the soul. A name with major buzz at the 2014 SXSW festival, Bobby Patterson is a must see #NearbyMuseumTower. It’s time the world got more soul. Listen, dance and delight in the magic of tango in Klyde Warren Park. Revel in the romance of Argentine tango music and an evening under the stars in the warm springtime weather. Enjoy a Tango lesson with Dallas masters, a dance performance and an open dance floor. Exhilarating live horse racing has returned! This year, Lone Star Park hosts its 19th spring season of live thoroughbred racing. Well into the blissful summer, there will be plenty of entertainment at the track including live musical performances by notable artists such as Josh Abbott Band, Pat Green and more. Take me out to the ball game! The Texas Rangers 2015 Season is in full swing. Head out to Globe Life Park in Arlington this month for the excitement of baseball, and not to mention, the opportunity to indulge on some over-the-top ballpark bites. This month, the Texas Rangers face the Oakland Athletics, Kansas City Royals, Cleveland Indians, and Boston Red Sox at home. America’s favorite pastime is back! Complete schedule and ticket information available online.